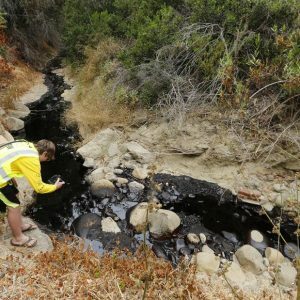 Oil Spill History and Ecotoxicology | Oil at Coal Oil Point: Pipeline or Seep? Fresh tar dots the wash line at Coal Oil Point on the afternoon of May 22, 2015. 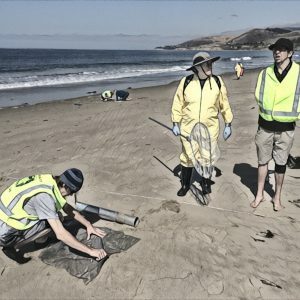 The University of California’s Natural Reserve System (NRS) is an incredible network of protected areas spanning the state of California. These areas provide much needed spaces wherein researchers can study California ecosystems minimally impacted (and yes, I know that is a relative term) by our voracious appetite to burn, pave, and manipulate all we see. I have been working on, in, or for one or more units of the NRS since my days as an undergraduate at UC Santa Barbara. If this is indeed pipeline oil, it has moved at least 20km (12 miles) down coast as the crow flies. In reality if this is pipeline oil it went out to sea and then arced back in with swell and onshore winds for perhaps a journey closer to 25 km. 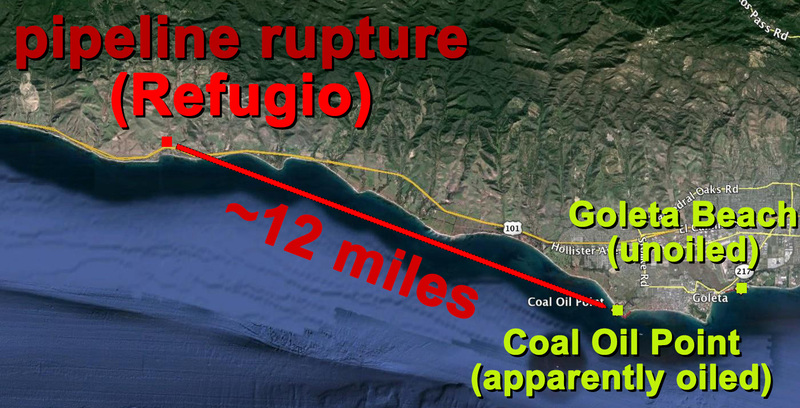 One key thread in the coastal NRS necklace is Coal Oil Point. This reserve is managed and stewarded by some wonderful folks, expert in all things stick insect-y, parasitical, and natural history-esque. 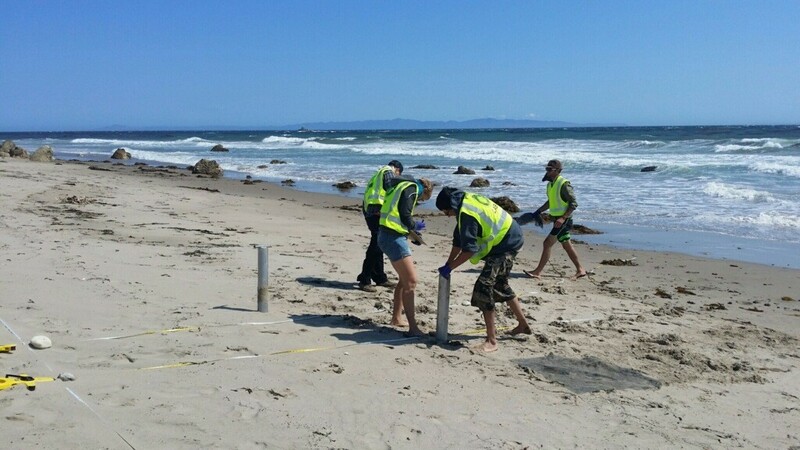 Reserve manager Dr. Cristina Sandoval (and her partners in crime Dr. Kevin Lafferty and Tara Longwell) kindly facilitated our access today even though we had not gotten our NRS permit ducks in a row in before the spill occurred. The most notable things here today were the wind (a strong, gusty onshore flow), conspicuous tar patches concentrated at the washline, and endangered snowy plovers (which we made sure to give a wide berth). We certainly had fresh tar and more weathered tar balls across lots of this beach. 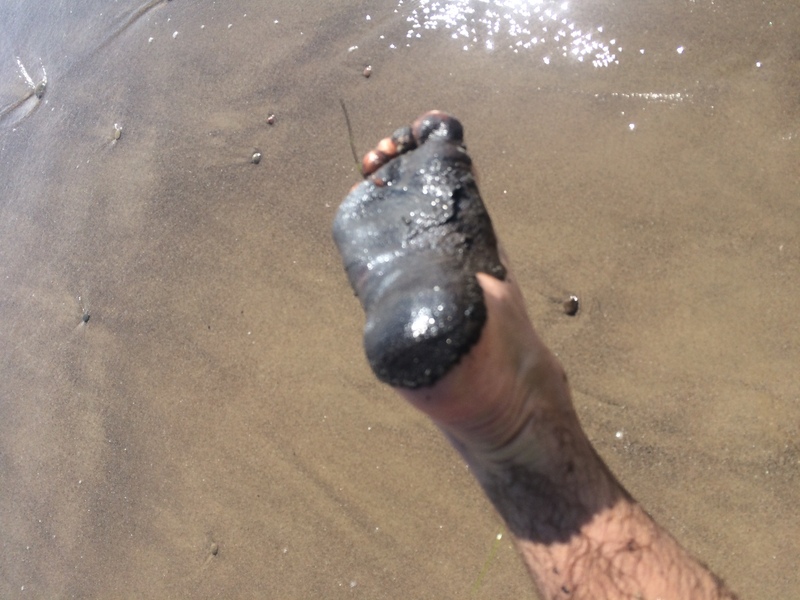 It is tough to tell if this is simply tar seeps or if this is from our Refugio spill. CDFW monitoring teams were on site as we began surveying and we had a quick powwow with them. 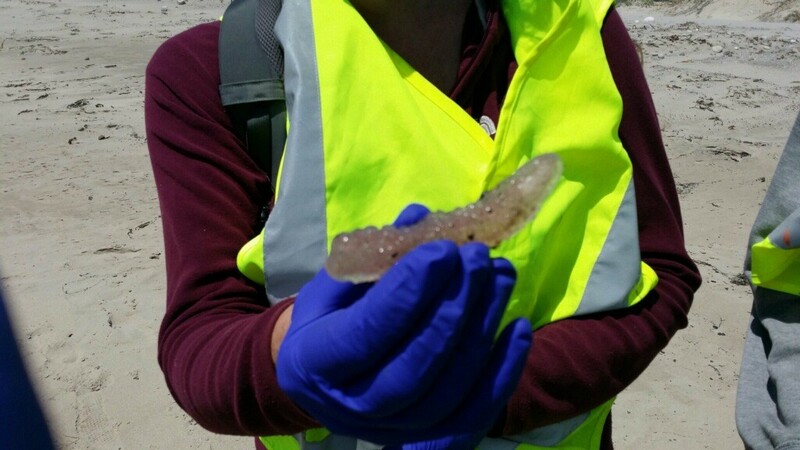 They took samples to fingerprint the oil, but felt it unlikely to be pipeline crude. I’m not so sure. It certainly seemed to be more than my recollection of the background levels at this site. The freshness of some patches and concentration near the waterline and the ubiquitousness of it (see Alex’s foot below) make me think this may well be pipeline crude. 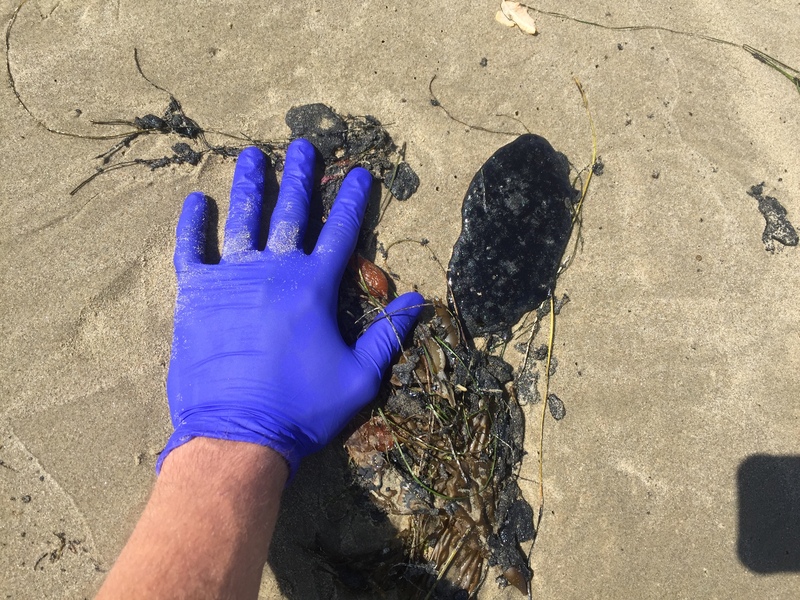 It is important to note that Goleta Beach (where our first team sampled this morning) was tar/oil free. Stay tuned. Back to work. The foot of the 4th Place State Longboarding Champ and beach geomorphologist extraordinaire Alex Greene apparently encountered some oil at Coal Oil Point today. 19:00 update: Note that Lance Orozco at KCLU is reporting that incident command believes littoral oiling is restricted to no further west than El Capitan. If correctly, that implies we were only seeing seep-related hydrocarbons here. 23:00 update: This most recent map from indecent command suggests that the goop we were seeing at Coal Oil Point may well have been weathered pipeline oil. 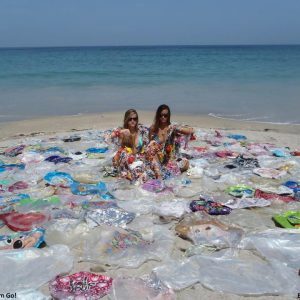 I have visited Coal Oil Point to enjoy the excellent surfing, diving, and other recreational activities for the past decade. 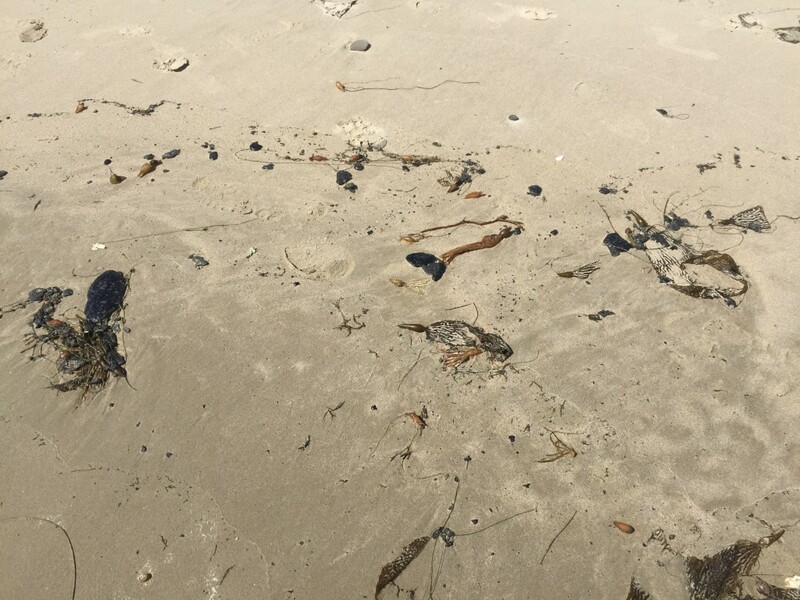 I have always taken note of naturally occurring tar that finds its way onto my feet and surfboard, but I have never in all my years of visiting this beach seen it this bad. 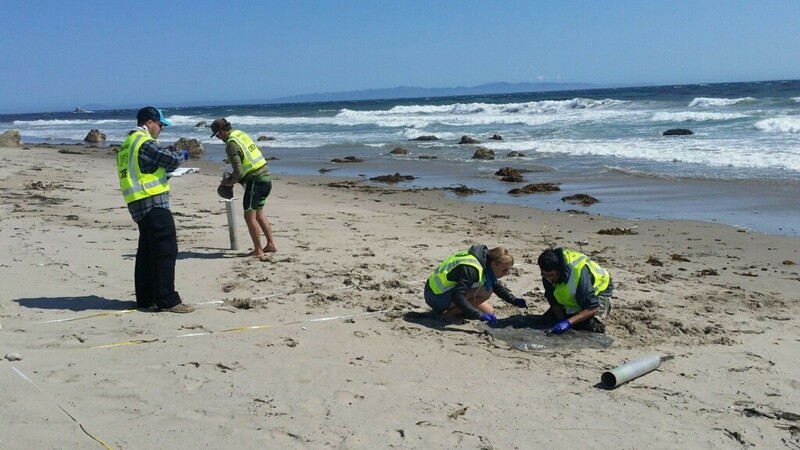 There is no doubt in my mind that the excess oil I experienced on the beach while we were surveying last week came from the Refugio Beach oil spill. While we were actively taking infaunal sample I noticed seawater left a fine film or residue on my body as well as research equipment. As surveying continued throughout the day, the film grew to a thick layer of sticky oil that covered my clothes, skin, and research equipment. The oil/tar was fresh, highly sticky, goopy, and tacky. The oil/tar bonded to anything it touched, this is very uncharacteristic of the oil/tar that I commonly find in this area which is normally in a solidified, classic “tar ball” form.